Launched in 2014, the IEEE IoT-J publishes papers on the latest advances, as well as review articles, on the various aspects of IoT from open call and special issues. Topics include IoT system architecture, IoT enabling technologies, IoT communication and networking protocols, IoT services and applications, and the social implications of IoT. The current issue is available in IEEE Xplore. 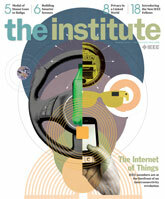 The IEEE IoT-J solicits original work that must not be currently under consideration for publication in other venues. For more information, view the Call for Papers. IEEE Communications Magazine - This award-winning magazine brings you the latest international coverage of current issues and advances in key areas of wireless, optical and wired communications. Written in tutorial applications-driven style by the industry's leading experts, IEEE Communications Magazine delivers practical, current information on hot topics, implementations, and best industry practices. IEEE Transactions on Communications - The IEEE Transactions on Communications (TCOM) publishes high-quality papers reporting theoretical and experimental advances in the general area of communications. TCOM has a broad scope spanning several areas such as wireless communications, wired communications, and optical communications. IEEE Communications Letters - IEEE Communications Letters provides researchers with an ideal venue for sharing their newest results in a timely manner. Every month this journal publishes 20-25 short (up to 4 pages) high-quality contributions on the theory and practice of communications. IEEE Wireless Communications Letters - Publishes timely, novel and high-quality recent results on Wireless Communications in letter format. IEEE Wireless Communications Letters have a 4-page limit. The journal's goal is rapid dissemination of original, cutting-edge ideas and timely, significant contributions in the theory and applications of wireless communications. IEEE/ACM Transactions on Networking - The IEEE/ACM Transactions on Networking's high-level objective is to publish high-quality, original research results derived from theoretical or experimental exploration of the area of communication/computer networking, covering all sorts of information transport networks over all sorts of physical layer technologies, both wireline (all kinds of guided media: e.g., copper, optical) and wireless (e.g., radio-frequency, acoustic (e.g., underwater), infra-red), or hybrids of these. IEEE Transactions on Network and Service Management - IEEE Transactions on Network and Service Management (IEEE TNSM) is a journal for timely publication of archival research on the management of networks, systems, services and applications, as well as on issues in communications software, service engineering, policies and business processes for network and service management. IEEE Pervasive Computing - IEEE Pervasive Computing explores the many facets of pervasive and ubiquitous computing with research articles, case studies, product reviews, conference reports, departments covering wearable and mobile technologies, and more. IEEE Sensors Journal - The IEEE Sensors Journal is a peer-reviewed, semi-monthly online journal devoted to sensors and sensing phenomena. Access the IEEE WF-IoT Conference Proceedings in IEEE Xplore. The IEEE IoT Brain Trust series is a collection of blogs exploring IoT in the industry. In June 2016, IEEE-USA, along with the IEEE Internet Initiative, had the opportunity to comment on the National Telecommunication and Information Administration's role in promoting and regulating the IoT. IEEE Standards Association (IEEE-SA) Releases Internet of Things (IoT) Ecosystem Study in Advance of Key IoT Industry Events. IEEE-SA engaged stakeholders in key regions of the world to create an IoT Ecosystem Study. The study comprises three principal areas: Market, Technology, and Standards, along with an examination of the role of academia and research and the importance of user acceptance. An executive summary (PDF, 116 KB) of the study is available. IEEE members are at the forefront of an interconnectivity revolution. The IoT Comic Book, Inspiring the Internet of Things, is a fun, easy to read and understand publication about the Internet of Things. Released by the IoT Forum and Alexandra Institute, the comic book features 15 illustrative IoT application scenarios, over 25 IoT concepts, and 4 IoT expert interviews. With smart home devices now owned by 15% of households, IoT products for the home are catching on. At the Consumer Electronics Show (CES), you can expect to see the latest in IoT smart home gadgets, smart tech partnerships, and advancements in voice-activated technologies. Additional tech on display includes facial recognition, thermal imaging, and connected luggage. The article, "On Searching the Internet of Things: Requirements and Challenges", recently published in IEEE Intelligent Systems, examines the need to develop new search engine solutions to effectively index, crawl, and find data that IoT devices need to collect while ensuring the data remains safe from hackers. The original IoT vision is of a hyper-connected global ecosystem in which "things" communicate with other "things" whenever needed to deliver highly diversified services to users. Yet, today, vendor-specific solutions have created local IoT silos. To address this situation, many IoT researchers and industry leaders are now focusing on interoperability.